Minimum Order Quantity :- 5000 Bags. Offered in different variety of designs, prints and dimensions, theseMultipurpose PVC Bag are durable and protect products from dust and water. Being lightweight in finish, these are easy to use and can be offered in both printed and plain options. Further, we can offer these with zip support for securing the products packed inside. 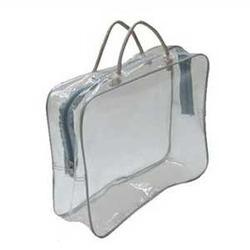 These bags are also available with hanger option that makes these find use for product display in retail sector. We "Akrishna Bags Company" from 2007 are a popular organization in the industry for manufacturing and exporting a wide variety of Bags. Our offered product array consists of Ladies Carry Bags, Travel Bags, Non Woven Bags, Laptop Bags, Jute Bags etc. Provided products are made by using supreme grade components at our end. We are offering these products in various sizes to choose from. Offered products are highly appreciated by the customers for their perfect quality, attractive design, light weight and high strength. Additionally, these products are offered to the clients at very affordable rates.